When I lived in Beijing, there was one place that I knew I wanted to go but I wasn’t too sure if I had the guts. The first time, we got to the door and then decided maybe it wasn’t such a good idea. We were a bit put off by the blacked out windows and random sounding music coming from the room. But then the second time, I went with another group of people and all three of us were determined. We were going in. I can’t say i’ve ever felt more dubious ordering food. From the woman in the tradition dress next to me staring down at me to the bizarre looking dishes in the menu. I wasn’t too sure we were meant to be here. But, it’s just a restaurant. Right? The North Korean restaurant in Beijing is just that. 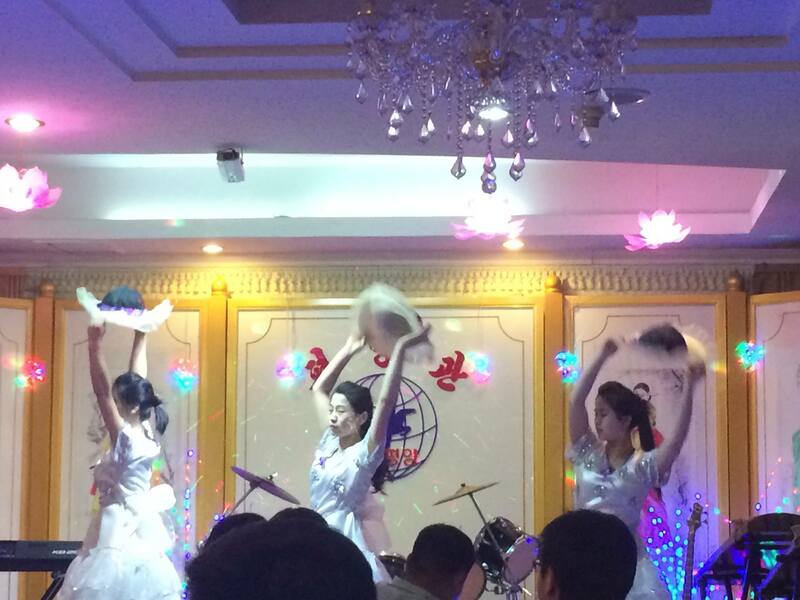 It’s supposedly run by the North Korean government who use the restaurant to earn foreign cash.The waitresses there are reportedly graduates of the Pyongyang music school and are known for their musical talents. It’s also thought that their families are members of the Pyongyang elite. They are ferried to and from the restaurant every day by minders and are rarely given the opportunity to go on outings. It’s almost like a bit of a joke until you realise that it’s real. 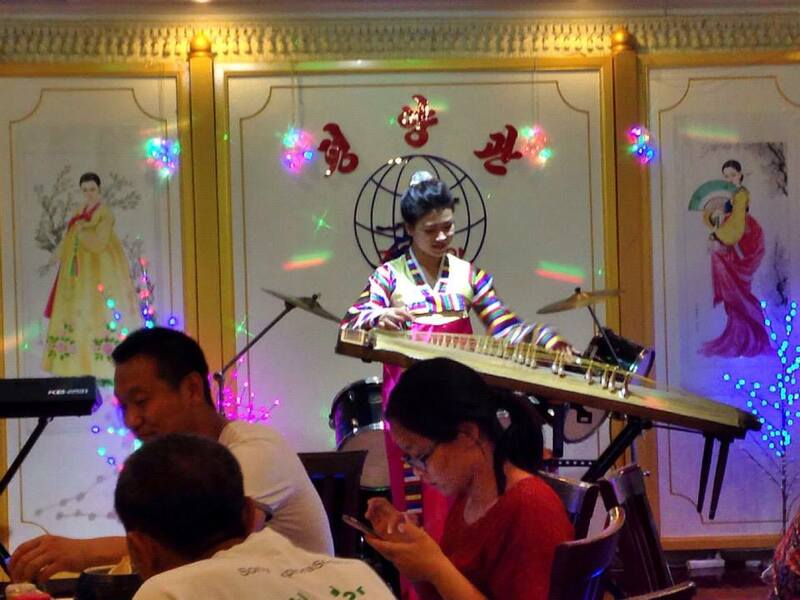 It’s easy to get stuck into enjoying the novelty of being there until you realise that for many people in North Korea, they can’t imagine the luxury of eating warm meat and listening to live music. I tuck into my Pyongyang noodles and slurp them around the bowl. They’re odd. It’s a cold dish with a sauce i’ve never tasted before. My mind floats away from the bowl. People are starving in this country just a three hour flight away. And then the music starts, the beer is in full flow (OMG it is the strongest beer i’ve had in a while) and the waitresses become performers for the Chinese and South Korean audience (plus us Americans and Brits). It’s also rumoured that North Korean officials come to the restaurant to sample some home comforts. I can’t say i’ve felt too comfortable with the idea of them playing anti American songs with us in the room. But they didn’t let it bother them. Amid the songs, video of famous mountains in the hermit kingdom are put on screens and every now and then soldiers are shown. My Chinese friends tell us they’re singing songs about imperialists. I try to catch some of the mandarin that they are speaking but it’s all got a strange sound to it. We take advantage spending some time catching up and drinking copious amounts of the North Korean beer. A few hours later and it’s time to leave. The meal cost considerably more than the average Beijing meal – perhaps to cover the costs of staff and to also send money back home. I have to say, I returned, just really to make sense of it all. 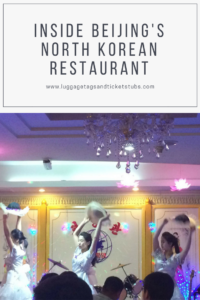 Following my return to the UK and the current events in relation to Otto Warmbier, the US student who died following his imprisonment in North Korea, i’d like to say that I would think twice about visiting a North Korean restaurant again. If it is true and the money was sent back to Pyongyang, I would hate to think that this money would go to Kim Jong-un himself and not to the real citizens of the country. This is your reminder to act and think responsibly when travelling. Would I go to North Korea now? Certainly not. "A trip back to Wimbledon"